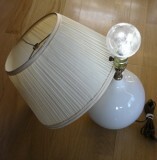 Recently I’ve been inspired to turn thrift store lighting parts into fancy or funky table lamps and pendant lights. My two greatest sources of inspiration? Talking to Savvy Practicality for hours about things you can get at a dollar store to incorporate into light fixtures (I haven’t tried the ping pong idea yet), and the “Put a Bulb in It” post at Retrorenovation (I drool every time I look at those pendant lights). Here are some upcycled lighting fixtures (mostly table lamps) that I’ve worked on over the past couple months. The icons below are pictures of the parts I started with. 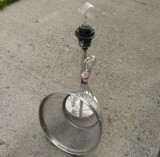 I turned these parts into a stainless steel and crystal teardrop table lamp. It’s probably my favorite of the upcycled series. I got the lamp and wire colander from a thrift store and added the crystal teardrops from another lamp I had plus some replacement crystals I got at a local lighting store. 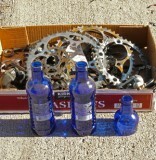 This outdoor chandelier was made out of Bawls guarana bottles and bicycle parts and several spray paint techniques. You can read a step-by-step article on how I made this elegant outdoor chandelier at Instructables. 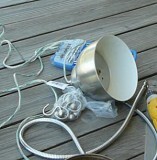 The hardest part of this projects was taking apart a string of outdoor lights which formed the basis for the chandelier. This table lamp is inspired by steampunk design features. 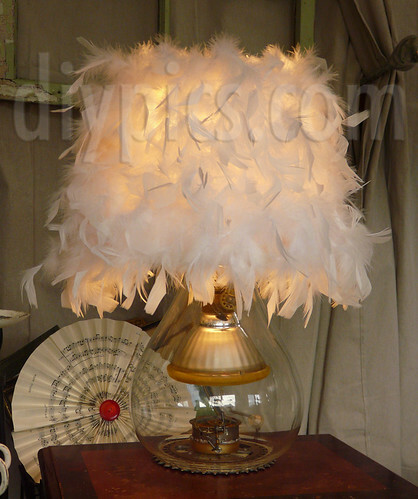 I put clock parts and an upside down flood lamp inside the glass part of the lamp, then glued a white feather boa onto the shade. I was aiming for a little more romance than the typical steampunk style. 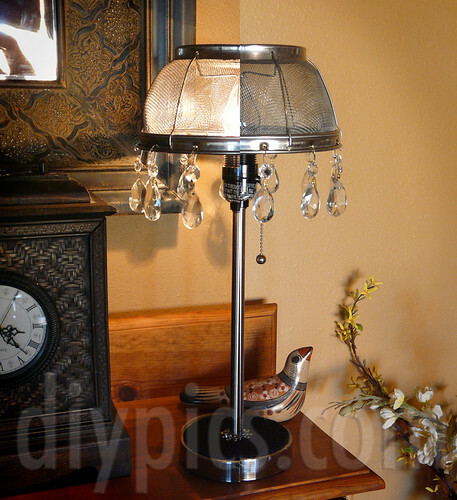 Here is a video tutorial for what I call a “steampluck” lamp. This stainless steel lamp got an upcycled treatment with a leather belt and a set of shower curtain hooks. I like the whimsical look of this pendant light. 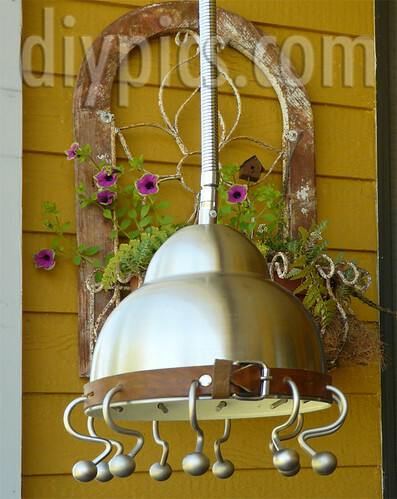 Here is the tutorial for this upcycled pendant light. My cost was about $13 for the stainless steel shade, the leather belt, and the shower hooks. I found two of these porcelain spherical table lamps at a thrift store. 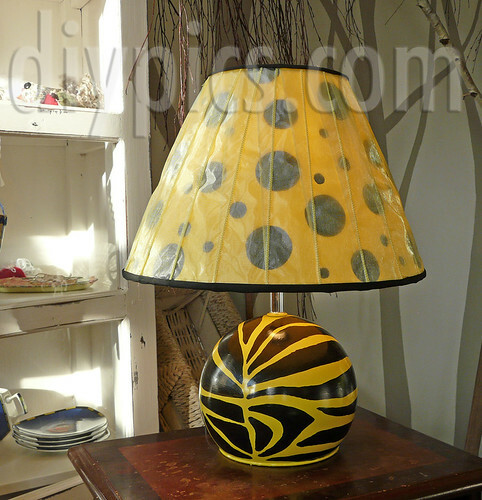 This one was painted yellow all over, then painted with black zebra stripes on the lamp part and black polka dots on the shade. 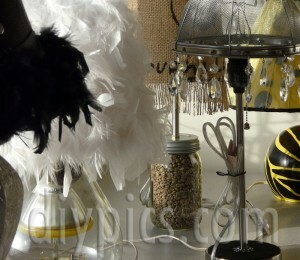 Then I took sheer yellow ribbon and glue it around the lamp shade, finishing it off with black bias tape. An easy upcycled fix for a kid’s room. I’m still not done finding things to make with pond algae (the algae fire pit bricks are stacked up waiting to be burned in the wood stove). I wanted to experiment with algae as a paper-like substance for light shades, and this is my first try. 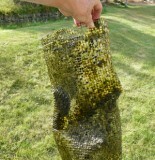 For this pendant light, I formed a tube out of wire mesh (chicken wire), sewed it shut with fine wire, and then poured algae water on the mesh until the whole structure was covered. 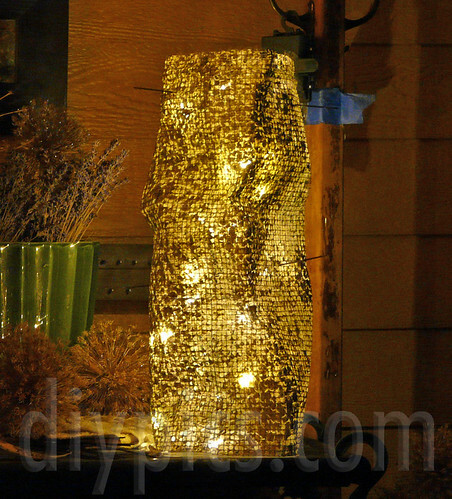 Then I let it dry, coated it with a clear sealer, and inserted a string of lights for this unique garden lighting. See my step-by-step instructions. I was going for a “cyberpunk romance” style on this lamp. I made that label up. Cyberpunk combines a super techie look with gothic darkness, and I added feathers to bring in a softness that cyberpunk doesn’t have. 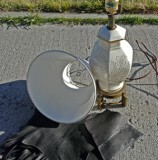 Hence, “cyberpunk romance.” The base of the lamp is a lovely porcelain with etched flowers and a chunky brass setting. For the shade, I glued odd pieces of black leather all stapled together onto a recycled lamp shade. 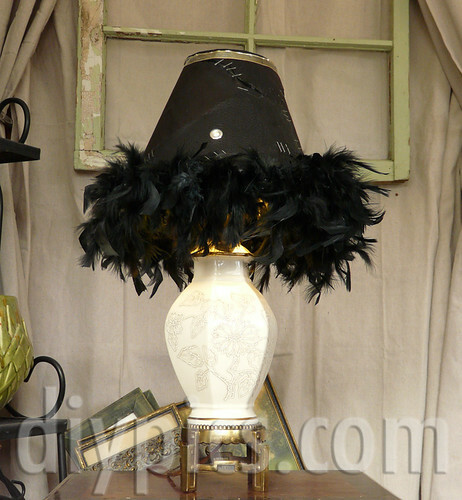 A black feather boa brings a romantic touch to this lamp. This was the easiest upcycled lamp. 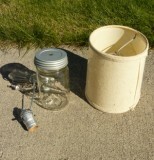 The mason jar already came with the lighting fixture. 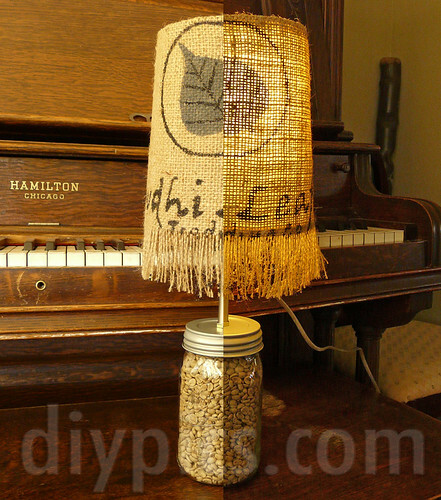 All I had to do was fill the jar with coffee beans (after padding the inside with a couple rolls of toilet paper because I didn’t have enough beans), then glue a piece of a burlap coffee bag over the shade and rip out threads at the bottom to form a fringe. Cost: $3.00 (if you can find the mason jar setup at a thrift store). 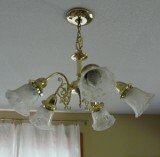 You can look at more pictures of this lamp in my article How to Update an Old Chandelier. 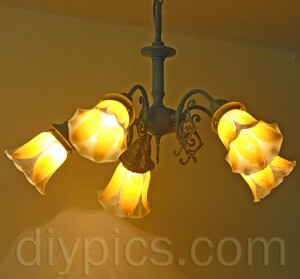 If you need a tutorial for changing out the old wires on a lamp, I found these instructions for rewiring a lamp on This Old House. Amazing ideas..loved each one. I really love the rustic look of steel and also the work of delicacy that u put forward. Thank you. From your moniker it sounds like you do a lot of upcycling too. I’d like to see your work! Adorei suas idéias! Lindo trabalho. Cheyenne is in LOVE with that zebra lamp! I hope theres a tutorial coming up on it. That would be an awesome Christmas present from me to her for their new room. I haven’t tried the ping pong idea yet either, but I am dying too!